When it comes to the Kelsey Museum of Archaeology’s collections, not all artifacts are created equal. Some call out to us intellectually, others emotionally. To that end, we asked our curators to name their favorite Kelsey artifact or object. Here is the fourth in a series. Seated dignitary from Karanis, Egypt. 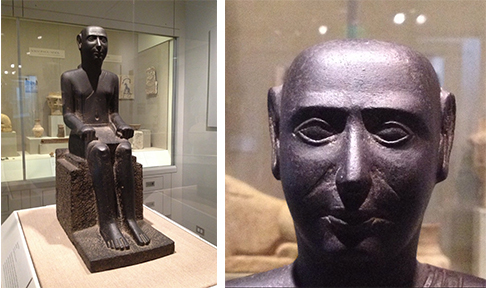 Favorite Artifact: “Statue of a Priest.” Black basalt. AD 50–100. Karanis, Egypt. KM 8218. Why. It’s hard to resist this statue: it’s a lively example of how Egyptian art adapted and survived into the Roman period. Although this isn’t a portrait, we get a vivid sense of the anonymous priest that this statue represents. With his smiling, eager expression, our priest seems ready to get off his seat, while the monumental quality of the statue attests to the endurance of Egyptian culture into Roman times. I never get tired of looking at this statue. About Artifact. This statue was found in a courtyard near the South Temple by the University of Michigan’s 1928 expedition at the ancient site of Karanis (modern Kom Aushim). It represents a very late manifestation of traditional Egyptian style, all the more valuable because of its archaeological content. Although classically Egyptian in its formality and frontal, symmetrical orientation, the statue’s proportions are not those of classical ancient Egyptian art. Its pose and monumentality hark back to the Old Kingdom but do not reflect the earlier canon of proportions. For example, the head and ears are bigger than one would expect. The figure wears not only a traditional Egyptian short kilt but also a sash across his chest. The shaved head and costume indicate a priest, and he would have served the cult of two crocodile gods of the South Temple, Pnepheros and Petesouchos. The priest would have participated in the daily cult activities of the temple and its periodic festivals, and he may even have been involved in oracles delivered by the crocodile gods or the mummification of actual crocodiles as votive offerings. Background. 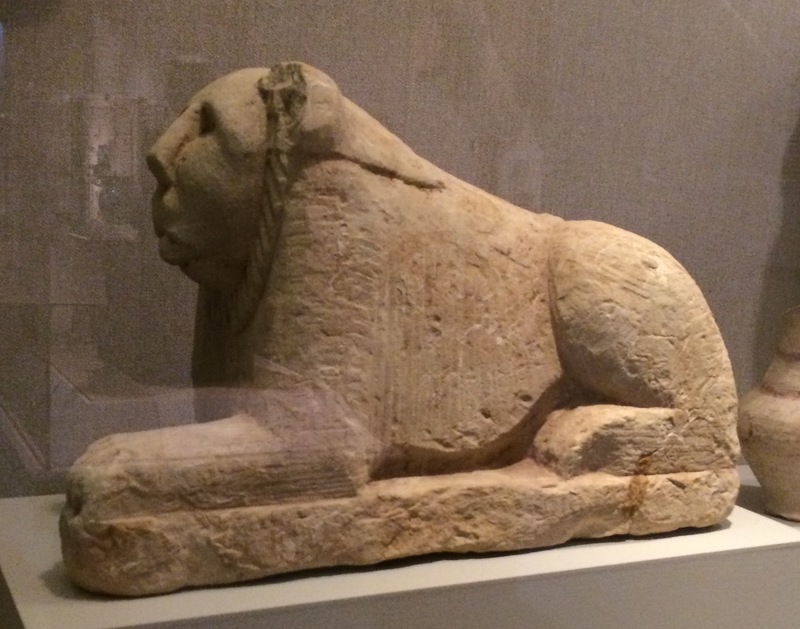 This statue has a number of parallels from elsewhere in Egypt’s Fayum region; a similar statue from Soknopaiou Nesos (modern Dimé) very closely resembles this example. Most of these statues are inscribed, some in Greek and some in Egyptian Demotic. The Kelsey’s statue itself would have had an inscription on its base but was left unfinished: minor detailing work on the figure was not done, and the base and back pillar remain rough, in preparation for an inscription that was never written. Therefore, we do not know the name of our Karanis priest and can only guess about the specifics of his titles and duties from what is known generally about priests of his time. Find It. Fittingly, “Statue of a Priest” sits serenely (perhaps contemplating the day’s temple activities) in its own exhibit case on the first floor of the William E. Upjohn Exhibit Wing of the Kelsey Museum of Archaeology. Look for it between the Graeco-Roman Egyptian case and the stairway leading up to the Roman galleries. Check out Wilfong’s new book, Life, Death, and Afterlife in Ancient Egypt: The Djehutymose Coffin in the Kelsey Museum of Archaeology.